Representatives from the Centre for Research and Technology, Hellas (CERTH), the DELTA project coordinator, presented some of the core ideas and innovations of DELTA at the 2018 International Conference on Innovations in Intelligent Systems and Applications (INISTA), sponsored by the Institute of Electrical and Electronics Engineers. The conference, taking place in CERTH’s home of Thessaloniki in Greece from July 3rd to 5th and in its 14th year, brought together researchers involved in the multi-disciplinary fields of intelligent systems to foster the sharing of ideas and improved communication. DELTA partners from CERTH had a specific interest in one the Special Sessions on day 2 of the conference, with project co-ordinator Dr Dimitrios Tzovaras jointly organising a session on enabling blockchain technologies for intelligent systems. A central part of the DELTA project is investigating how the blockchain can be utilised to boost efficiency in demand response. With DELTA at such an early stage of development, the INISTA conference showcased the high level of progress which has been made to date by the DELTA partners. 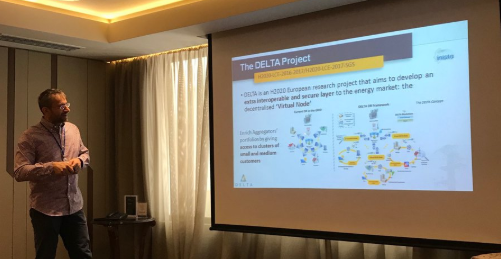 Early July was a busy time for DELTA on the road, with Dr Ioannidis presenting the project in Rome at the European Networking Workshop on Energy Systems on July 5. The workshop was organised by the Italian Agency for the Promotion of European Research (APRE). The event aimed at bringing together academia, companies and research centres to boost the creation of project consortia. Dr Ioannidis presented DELTA, and how it is seeking to improve synergies in the smart grid ecosystem. As the project progresses DELTA partners will be attending numerous events around Europe to highlight how DELTA can unleash the demand response potential of small and medium scale prosumers in Europe. Keep up to date with the project through our social media channels and the news section of this website.